The vertical fin is an abbreviated surface on the D.VII and can be constructed after the horizontal stab is mounted to the fuselage. 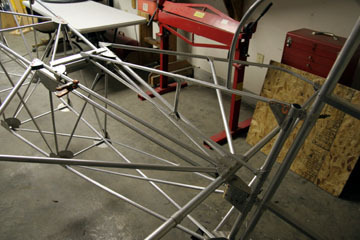 Once the fin is in place the rudder can be finished and the upper brace cables fabricated. An interesting historical note concerning the Fokker D.VII is the plane was originally designed without the vertical fin with only the rudder providing lateral stability (or lack of...). This was common practice among the warbirds of the day. Several new German fighter designs were gathered for a competitive fly-off near the end of 1917, one of the pilots being the Red Baron himself. He would die in combat just a few weeks later. The Baron liked the D.VII the best but commented that it lacked stability in a high speed dive so the Fokker designers added the vertical fin on the spot. When The Red Baron reflew the trial he pronounced the D.VII to be "perfect". It proved to be the first "modern" fighter in that it handled similarly to what we would expect in a conventional design. Finished the vertical stab and also got the horiz stab brace tubes installed. The short tube was added so the fabric wouldn't distort the two long tubes when it is shrunk. 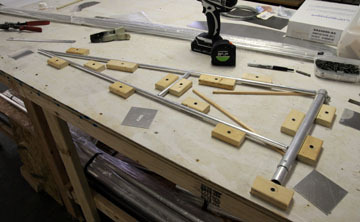 Joining the 1/2" tubes to the 1" spar tube was a little tricky due to the large difference in diameter. 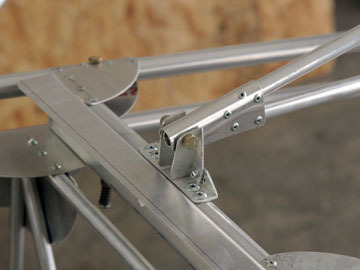 Also complicating things is the rudder hinge. 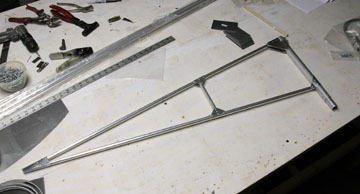 I cut out the gusset around the hinge so it would fit better and the gussets were also bent slightly to make them transition better to the smaller tubes. Here is the initial fitup of the upper tail post and vertical stab. I intend to weld up a small 4130 fitting to secure the forward end of the stab to the horizontal stab. 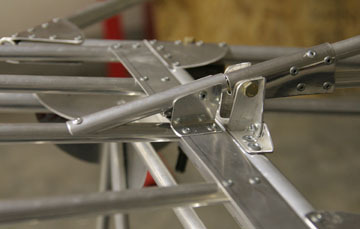 The forward rudder bow /rib can now be finished. 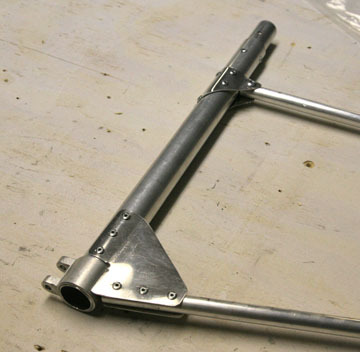 Here is a fitting made from aluminum angle that secures the front of the vertical stab to the horizontal stab. The little dorsal fin fairs the vertical stab into the turtle deck.